Fab Beatles facts in fans' number 1 week . Beatles Radio: The Beatles, Solos, Covers, Birthdays, News The Fab 4 and More! An amazing 70 bands from more than 20 countries, along with fans from around the globe, will be flocking to Liverpool, spiritual home of the Fab Four, to celebrate. JAMES MOORE has dug out 20 memories from their long and winding road..
1. 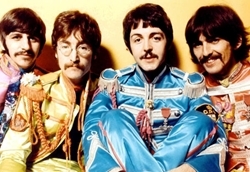 The Beatles have sold more records than any other group – over one billion units – and had 31 UK top 40 hits including 17 No1 singles, plus 15 UK No1 albums. 2.Hailing from Liverpool, John Lennon and Paul McCartney met at a church fete in 1957. By 1960 the song-writing duo had teamed up with guitarist George Harrison and changed their name from the Silver Beatles to the Beatles.